No forum account? Sign up HERE and check your spam folder for your log-in details! ...Another fantastic free-prize draw for Pro9'ers!!! 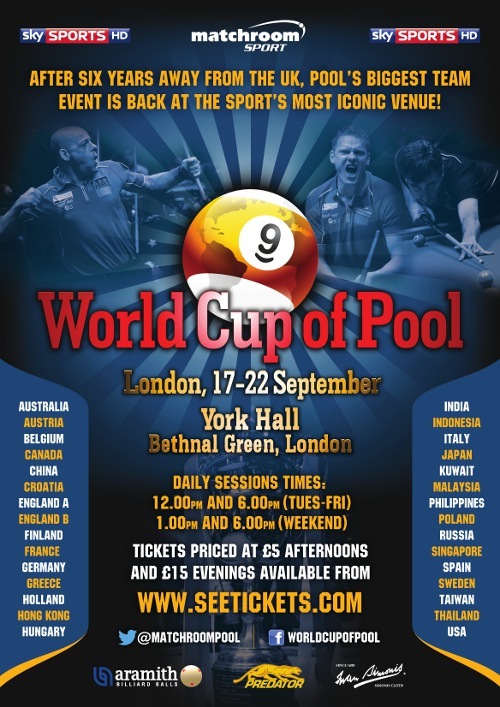 The "Mosconi" is away in Vegas this year, so we want the same roaring York Hall audience to add show-stopping drama to the World Cup Of Pool - this 32 team event features the world's best 64 professional pool players, representing their nations and competing for a slice of the massive $250,000 prize money. Your national team needs your support - be the third man, be loud, be there! - A drinks voucher to the value of �5. 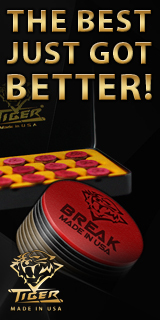 - Entry into the draw to win a Predator cue signed by the four finalists. If you win this competition, and you can't be there, we'll still enter you into the draw for the Predator Cue, AND send you a signed poster as well - so enter here now! 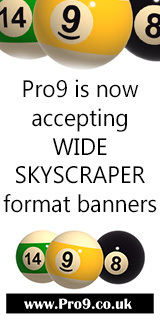 No Pro9 forum account? Just sign up HERE and check your email for confirmation code! We'll use the EuroMillions lottery to randomly select the single winner, so everyone can see Pro9 competitions are always totally fair and random. If you're the winner, we'll contact you as soon as we can. Thanks for playing in our fun game - good luck! Eng A. - Daz & Boyes always. Page took 0.044702 seconds to load.